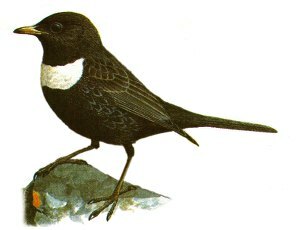 The male Ring Ouzel has a black body with a bold white band across the breast. Breeds locally through Europe except Iceland. Winters in Southern Europe. Considered a red list species in the UK due to declining numbers. Most often on high moorland ground, peat bogs and tors, particularly where there are dry stone walls which it often nests in. Can turn up almost anywhere whilst on passage. 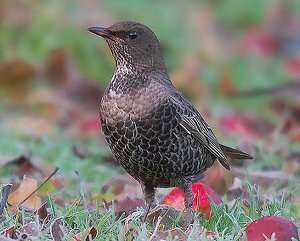 The Ring Ouzel, unlike it's close relative the Blackbird, is a shy nervous bird, seeking out remote breeding areas not disturbed by too many ramblers or dog walkers. They are most often seen on a distant rock making a rattling chatter which is their alarm call. 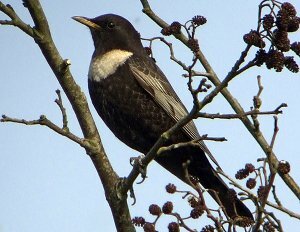 Male Ring Ouzel: Note the pale edging on the wing feathers and the birds flanks. This image shows the distinctive pale wings, black body and white breast band. Note the birds small head and the slight mottling of the flanks. 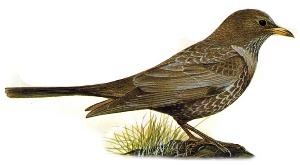 The female Ring Ouzel has a dark brown body, the feathers on her back and breast have a pale edging giving a 'fish scale' like effect. Note the light edging to the breast feathers and the very faint pale breast band. At first sight this bird is not unlike a female Blackbird.